Lately I’ve been hearing a lot about the Paleo Diet. It is a diet that has been around a long time, but seems to have picked up a lot of steam this past year. Since I have been wanting to learn more about nutrition I thought I would look into it. Eat whole, unprocessed, nutrient-dense, nourishing foods. Prioritize grass-fed and pastured meats and eggs, wild-caught seafood, and vegetables. Enjoy fruit, nuts, and seeds in moderation. Avoid foods that will harm us by causing systemic inflammation, wrecking our guts, or derailing our natural metabolic processes. Abstain from toxic, pro-inflammatory foods like gluten-containing grains, legumes, sugar, and the laboratory-concocted Frankenfoods found in the middle aisles of your neighborhood supermarket. Some people compare it to the Atkins diet because it has a lot of the same philosophies. It is a little more extreme than the Atkins diet though because it takes away dairy as well. Basically in the Paleo Diet, if the cavemen didn’t have access to it, then we shouldn’t eat it either. 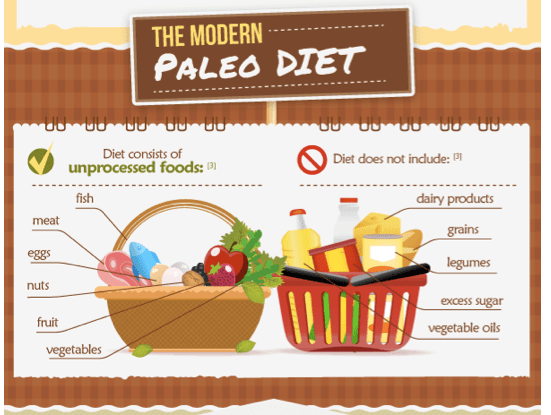 The Paleo Diet transforms the body from burning sugar for energy to burning fat for energy. This isn’t an easy task in today’s world as there is sugar hiding everywhere, but I think that being a fat burner is definitely better than having your body depend on sugars. So even though I think there are definite benefits to the Paleo Diet, I don’t think it is the end all be all for everyone. I don’t believe there is a magic answer for everyone. I really think that it depends on each person individually. I also think that some of the benefits of the Paleo Diet aren’t really isolated to it. I think eliminating processed foods would be beneficial to anyone, no matter what type of diet you are on. Also consuming less sugars is definitely a habit that anyone trying to lose weight should start. So even if you don’t believe in the diet itself you could take away some of the definite positives it provides.